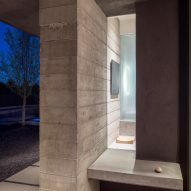 Glazing at this concrete Santa Fe home by American studio Specht Architects offers expansive views of distant mountains, while casting shadow patterns across interior walls. 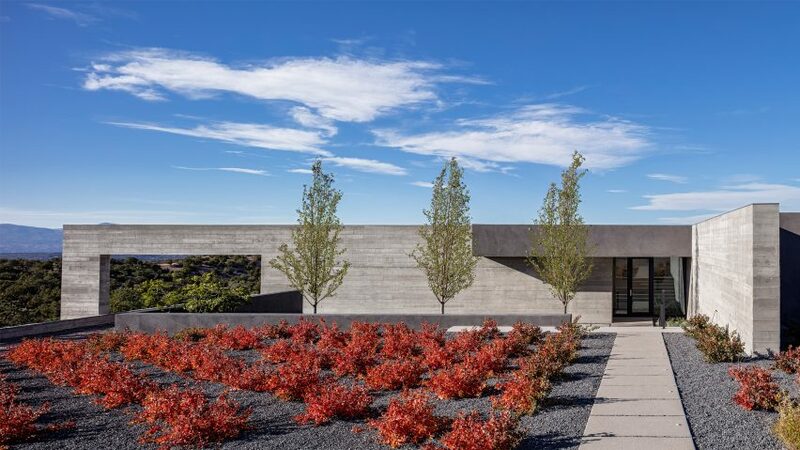 The Sundial House is situated on landscape characteristic of northern New Mexico towns – undulating, arid terrain reaching toward nearby mountains. To comply with the region's height restrictions for buildings, the architects built the home on a sunken plane. From the road, a slabbed walkway leads past a terrace and down a staircase to a courtyard entry. Both levelled areas have gardens that spread up to the facade's western limit. Shrubs planted in the higher terrace balance the tall trees rising above from the lower enclosure. The ash-coloured soil filling both plots strengthens the continuity between the gardens, and creates a smooth transition to the light grey of the home's exterior. The structure itself is built around two perpendicular, board-marked concrete walls on the recessed plane. 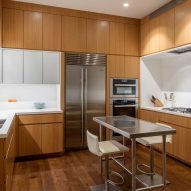 Through the intersection, Specht Architects aimed to better connect the home with the surrounding scenery. 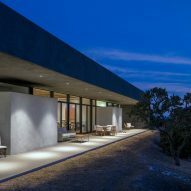 "This ridge-top house in Santa Fe is organised around a pair of perpendicular concrete walls that orient the house toward specific views," said the firm, which has offices in Austin and New York. The longer partition extends from the north to the south, defining the limit of the lower vestibule and cutting through part of the raised terrace. The east-west wall makes up the entry facade. Just short of where the two concrete partitions intersect, a threshold provides access to the home. The floor plan is divided into two rectangular sections by the north-south wall. 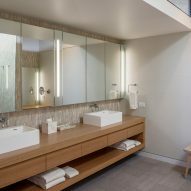 The entryway opens into the west half, which accommodates service rooms, a kitchen and small bedroom. Past an opening to the right of the threshold, the east side stretches along the partition to offer views of rolling hills across the interior. Two bedrooms with adjacent bathrooms flank a central lounge. The cantilevering roof covers a patio that runs the length of the east facade. Emphasising the division of the house, the ceiling and walls of the east volume fall short of the north-south partition. The architects covered the void with a short strip of glazing that spans the gap. The light admitted through the glass serves to provide both added brightness and interior ornament. 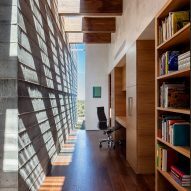 The shifting striations cast by the wooden ceiling beams resemble a sundial – the time-telling device from which the residence takes its name. 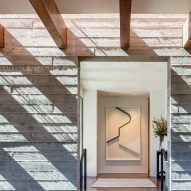 "A long, thin, strip skylight casts shadows on a highly textured board-formed concrete wall within the house," the firm's founder and principal Scott Specht told Dezeen. "These shadows change over the course of the day, and you can 'feel' the passage of time due to the changing lighting conditions." 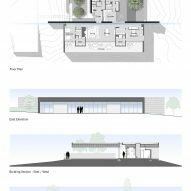 By directing the house towards the best landscape vistas and including temporal characteristics of the site a into the design, the architects sought to create a home that is well incorporated into its surroundings. "The movement of the sun, and the way the house incorporates and modulates this, really make the passage of the day an important part of the experience of the place," said Specht. 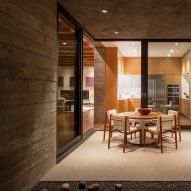 "The house also reaches out into the landscape, with the concrete walls extending from inside to outside and out into the landscape beyond," the architect added. Other desert homes recently completed in the American Southwest include a residence enclosing a series of limestone-walled courtyards and an Arizona home elevated above the surrounding landscape. Photography is by Taggart Sorensen.